Netflix is currently one of the best places to find interesting documentaries of all kinds. In this roundup we’ve picked ten music-themed documentaries available on Netflix that can help inspire your own musical ideas and creative growth. Here are ten picks that will open you up to other artists’ lives, teach you a thing or two about music history, and may help you get out of a creative funk. As of this article’s publishing, these films are available for streamable on Netflix, but since Netflix constantly updates their streaming library, watch them soon if you want to catch them. If you can’t find these films on Netflix in the future, they’re surely worth checking out elsewhere. 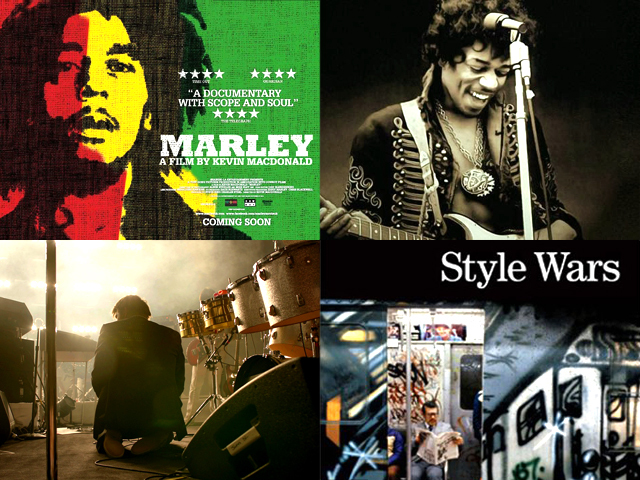 Marley is an epic documentary on the life of music legend Bob Marley created by director Kevin Macdonald (One Day In September, The Last King of Scotland) and released to critical acclaim last year. Using archival footage of Marley along with more recent interviews, Macdonald gets deep into the artist’s life with some great concert scenes and fascinating insights into his life and artistic development. Dubspot’s Barry Cole was the music supervisor for this movie and played an integral role in the film’s soundtrack. Check out Barry’s full list of work at his IMDb page. If you’re a fan of LCD Soundsystem or James Murphy, this documentary / live concert is a bit of a tear-jerker as it’s the last show that the band will ever play. The film inter-cuts the live show with day-in-the-life moments of band leader Murphy both before and the day after the show. High production quality and a brilliant last performance make Shut Up and Play The Hits well worth watching. This documentary on Jimi Hendrix originally aired on PBS last year as part of the American Masters series and it’s currently available for streaming on Netflix. Interviews with musicians like Paul McCartney are cut with home movies, stories and previously unseen images of Jimi’s life and rise to fame, often taking note of his humble attitude and dedication to his craft as a musician. Style Wars is an award winning documentary that aired on PBS in 1983 and exposed the world to b-boy culture in the forms of hip-hop and graffiti. This is a piece of culture that influenced much of today’s hip hop and dance music culture and comes highly recommended for a look at 1980s urban culture in New York City. It’s currently streaming on Netflix and you can catch the entire film on YouTube as well. Beware of Mr. Baker is a fascinating piece of journalism that combines a history of the infamous rock/jazz drummer Ginger Baker with a present day investigation into his current life. The end result is an inspiring look at the man’s dedication to craft and a thoughtful introduction to a man that many people fear (for potentially good reasons). Empathy wins in the end and the film reveals some amazing performances by Baker along with recent reflections on a long life in the music industry. Good Ol’ Freda is a film that looks into the life of Freda Kelly, a shy girl from Liverpool who worked for The Beatles throughout their entire career. While there have been many films about The Beatles, this film gets an inside look from someone who worked closest with the band and hadn’t shared any of her stories until now. 20 Feet From Stardom is an Academy Award winning film that documents the careers and importance of backup singers in rock history. The film shines a light on singers such as Merry Clayton, Darlene Love, Claudia Lennear, and Lisa Fischer and offers a history of the career of backup singers as a whole. Simultaneously the film advocates for the recognition of these artists who contributed greatly to the history of music. Upside Down is a rock documentary that follows the inception, rise, and eventual fall of Creation Records, one of the most influential UK record labels of the 1990s that spawned groups such as Primal Scream, The Jesus and Mary Chain, Swervedriver, Ride, and Oasis. At the core it’s a tale of friendship and a glimpse of indie rock culture in the UK during the 80s and 90s. You’re Gonna Miss me follows the life of psychedelic rock legend Roky Erikson and his band, The 13th Floor Elevators. While the film steps into some dark territory with Roky’s mental illness and drug addiction, it reveals brilliant moments of a man who had a deep influence on garage and psychedelic rock music. How to Grow a Band is a documentary that follows musician Chris Thile’s path to creating one of the most unique bands in modern history. Punch Brothers create a sound that is based in bluegrass but explores timing and textures of jazz, classical, and experimental music. The film follows the band on tour and through some important moments of growth as they discover this sound and figure out how to present it to the public.